It's the theme on twitter this week and you are all probably sick of it but the discussions have inspired me and when I'm inspired I write about it. Who wants to read uninspired writing anyway? Dave Wilber had an excellent rant in his latest TZP where he talks about how "if it didn't happen in a university trial it's not real." Now before I dive into this let me say I'm on the fence with this one. I agree with Dave's points of view...sometimes. Let me explain. A lot of the cool stuff in turfgrass management is happening outside of university trials. Most superintendents have their pet theories and are constantly experimenting with things to improve their operation. Improvement can mean different things for different operations. For me it means less pesticides and less money while keeping conditions the same or better than I was able to achieve with more pesticides and more money. I'm not saying this is for everyone and I know that a lot of people get confused by this. This blog isn't about telling people what they should be doing. It's about sharing what I'm doing so that if you share the same goals as I do, you might be able to learn from my trials, failures, and successes. With open sharing we all benefit and can move forward quicker. I'm not asking anyone to agree with me. If anything I'm asking other to question it so that I can hopefully learn and improve. While some hate, shun and are completely against what I write about, other have open minds and can see what I am trying to accomplish here. So yeah, I'm trying a lot of things that most university professors and researchers would not recommend. The list is long but I wrote a post outlining the stuff I'm most interested in here. So there are a lot of instances where I am not doing what science says I should be doing but guess what, science is always improving and there are people who need to inspire the scientists to do the objective tests. Those people are the front line workers, the superintendents as Dave describes in his podcast rant. The interpretation of science is also flawed in my opinion as it points us to only trust the best case result and tends to suggest that we ignore less effective methods. I wrote a post in 2014 about how I deliberately do not always choose the best solution for my problems as defined by scientific research. The best solution in a simple, tightly controlled experiment doesn't always align with my end goal. It's a common complaint of mine about conference presentations. To me, they seem so old news. They are the safe topics, the studies topics and the uninspiring topics. I think that what most superintendents want to hear about is all the crazy stuff that the other guys are trying. When we share this information we can take pieces of it that might work for our operation and possibly improve things and maybe inspire some new science. Yes, research is very important and I base most of what I do off of scientific findings. I'm totally against trying "dumb" things that result in failure as I ranted about in my post about organic golf. Garlic dust? Really? There's a reason that course didn't work out and it is because their plan was based on feel good ideas and not things that actually work. I've even been accused of being the guy Dave describes as saying "if it didn't happen in university research it didn't happen." I'm actually accused of this quite often. Usually by someone trying to sell me something....funny how that works. One such instance that comes to mind is compost tea. For the most part, compost tea hasn't been found to offer any measurable benefits to turfgrass as far as science is concerned. There are a ton of superintendents out there, though, that swear by it. I was once approached by a sales person for tea who explained to me that I could save 15% on my fertilizer budget on greens for only $150/acre every 2 weeks on compost tea applications. I replied, "I only spend $250/acre per year on fertilizer! So if I spend $150 every 2 weeks I will save $37 in fertilizer each year? As you can see the economics just don't add up! "Well it also reduces pesticides," he explained. "By how much? Surely you can show me some info on that," I replied. Back a few years before all the great research John Dempsey had done on phosphite there were a lot of skeptics. Inspired by John's research I decided to give phosphite a try. 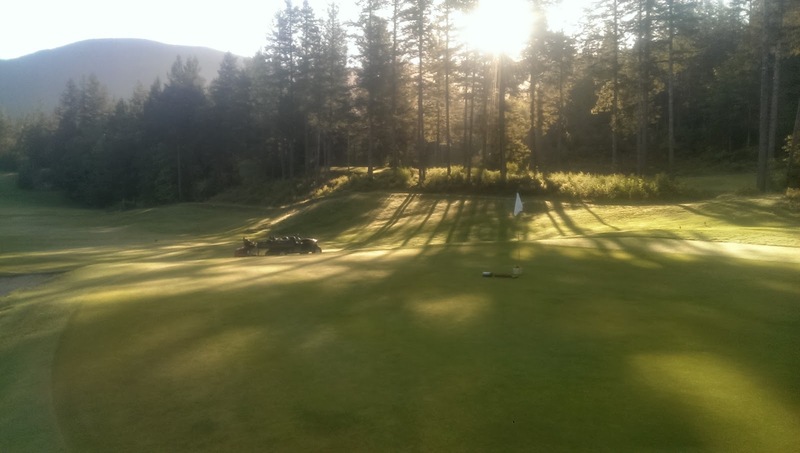 After a few years it was easy for me to see that phosphite worked as I described in this post. So far phosphite has been cost neutral when compared to traditional pesticides and has helped me reduce my EIQ on my golf course. It was easy to see the benefits of this product and it didn't cost me extra money. In time, I think it will actually save me money, but that's just wishful thinking at this point. But maybe science is missing something about compost tea? As I described in my recent disease management post, it is a combination of everything that makes the difference for me, not one single thing. Unfortunately I can't yet find a place for tea in my program. I can't make it fit. So no, I'm not closed minded for not using compost tea. It simply does not make sense for my goals at my operation. It will cost me money and probably won't help me reduce my pesticide use. Unfortunately for me, I need to see more data before I can commit the resources to these products and I really wish that those superintendents that use them would share their data so was can learn. Maybe it will help me achieve my goals but the risk right now isn't something I can afford to take. And don't be to proud to share defeat. I've had lots of things that didn't work out for me like this. Another example of something not yet fully supported by science that I use is growth potential. A minor twitter battle erupted this week about how GP (growth potential) is a "dumb" way to schedule nitrogen fertilizer. The thing is, the ways that I used to schedule fertilizer now seem dumb to me. Even though there aren't a hundred studies about growth potential fertilizer rates it made sense to me. The way that science was describing I schedule my fertilizer applications was not what I was seeing at my golf course. When I discovered the GP formula I saw it as a tool to help me better schedule my fertilizer, reduce costs, and eventually reduce pesticide EIQ and costs. Yes, I'm saying that GP probably has helped me reduce pesticides. No, there aren't any studies to show this to be true other than my experience with it over the past 4 years. By fine tuning fertilizer rates I have more control of the plant growth and pretty much everything that is associated with that growth as described in my recent post about my experience with growth rates over the winter and my disease management success. I first came across GP in 2012 and was immediately blown away as I described in this blog post. I've learned a lot along the way and have nothing but success but some people question this way of fertilizing grass because there still aren't many studies done on it (why not?). The theory of GP is backed by science there just haven't been many studies analyzing it's impact on turfgrass. I wish turf scientists would think about GP like "hmmm, that's interesting maybe I could do a study to look into this further" instead of saying it's "Dumb" without opening their minds to the possibility that we don't already know everything there is to know about fertilizing grass. Even with GP we are still guessing but in my opinion it's a far superior guess to other ways of fertilizing grass. While I'm at it. Science, why isn't anyone looking into PGR use over winters and disease spread by mowers and rollers? I'm seeing things here!